Do you like quilting? The IDT (Integrated Double Transport) Pfaff system is the best for quilt and everyday sewing. The thread-cutter, automatic or manual, snips both top and bottom threads without your intervention, and the automatic Presser Foot Lift raises it after the thread is cutted. And what about the electronic knee-lifter, the best to keep your hands free! Enjoy this superb sewing machine. Pfaff sewing machine Quilt Expression 4.2 makes the automatic tie-off at the beginning and the end of a seam and snip the needle and bobbin threads. 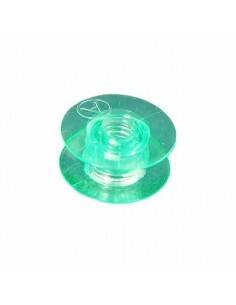 The bobbin thread sensor alerts you when your bobbin thread is running low. Select the option “Needle down” : the needle remains in the fabric, so you can pivot it. Question: buongiorno questa macchina cuce con qualsiasi tipo di filo (io uso Guttermn Mara o similari, in sintetico) oppure necessita di un filo apposta per il ricamo? La ginocchiera è già inclusa? 10 clear sewing machines Pfaff and Husqvarna plastic bobbins.